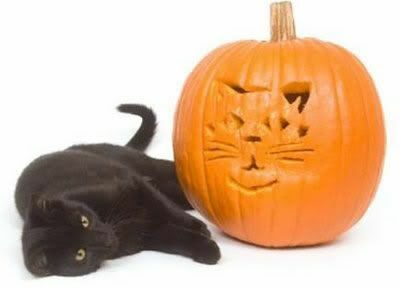 Earlier in this series I wrote about pet Halloween hazards but I thought it might be worth discussing another controversial Halloween danger that black cats face. Some people dismiss this topic as urban legend but Snopes, the Internet site that works to confirm or deny the rumors circulating out in cyberspace, writes that their investigation into the topic of routine sacrifices of black cats on Halloween was inconclusive. When looking for actual documentation surrounding the issue, I can’t find much. Back in 1999 the Washington Post covered why many animal shelters suspend the adoption of black cats near Halloween but in 2007 National Geographic quoted experts saying that ritual cat sacrifices was an urban myth and included this morbid cat picture of a black cat. (Found on November 1st). Even the Religious Tolerance website files the ritual abuse and sacrifice of cats under Halloween hoaxes. So, is it ritualistic sacrifice or morbid, sick individuals mutilating animals? My thought is that if it is happening to animals, and it escalates around Halloween, then why not keep those animals inside and delay placing them up for adoption for a couple of days? People have odd ideas surrounding black cats and usually have a story to share. I remember a cat that lived in the animal shelter where I was working as an adoption counselor. His name was listed as “Satin” but I somehow always called him “Satan”instead. When I complained about this to the kennel manager, she laughed. Turns out that his real name was “Satan” but they had changed it to overcome the stigma of the name and to get him adopted. That stigma surround black cats remains which is just a darn shame. Just where does it come from? Cats have often been associated with witchcraft as Your Magickal Cat details. Witches were also suspected of morphing into feline form and this belief persisted into the 17th century when witches and their cats were burned alongside each other. Today superstitious people in the United States and some European countries believe that black cats signify bad luck. I find it funny that in England this is opposite–you experience good luck if a black cat crosses your path. Personally, I think cats fare better if kept indoors for a variety of reasons–and keeping them in during this time of year is prudent. What do you think–leave your comment below? Hi Blaine! Good to see you here. There are many hazards that outdoor cats face and cars certainly are a big one. We don’t have too many outdoor cats around my home because of the predators. If they don’t get them the cars do…sometimes people take them in and adopt the cats–which is what we all hope happens to any missing feline instead of the more horrible alternatives. Thank you for your carnival submission. Thanks for stopping by! Hope to see you again and I have more to send in the future.